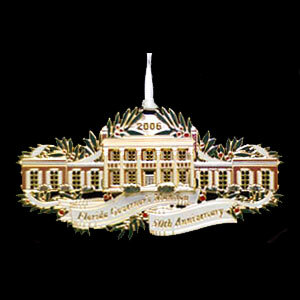 The Florida Governor's Mansion is replicated in stunning 24kt. gold finish in celebration of its 50th anniversary. This gracious Greek-Rival style building was inspired by the Hermitage, home of Florida's first territorial governor, Andrew Jackson. Listed in the National Register of Historic Places, the mansion has been home to 11 governors and their families since its completion in 1956.